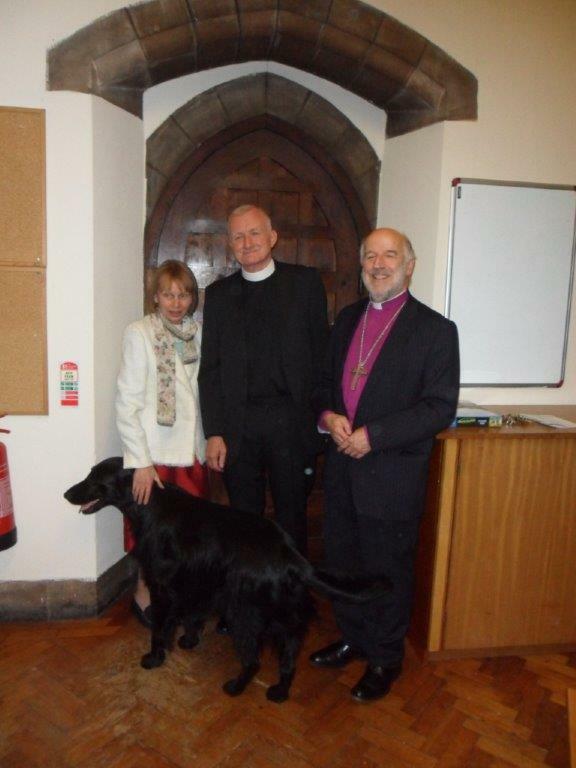 Richard Grosse, our Rector, was installed as a Canon of St Ninian’s Cathedral in Perth on 20th September 2015. At a very moving evensong service, Richard’s sister, Lorna, who had flown up from London especially for the service, read the second lesson. 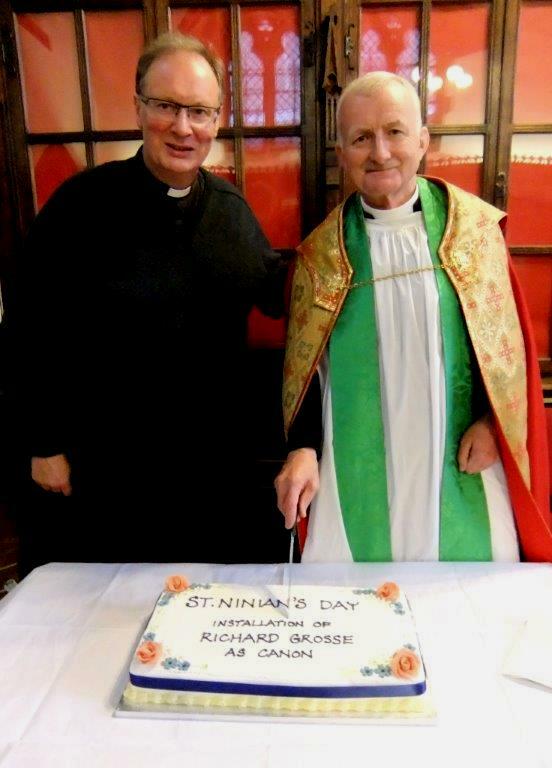 20th September is also St Ninian’s day and a special cake was commissioned to celebrate both events. 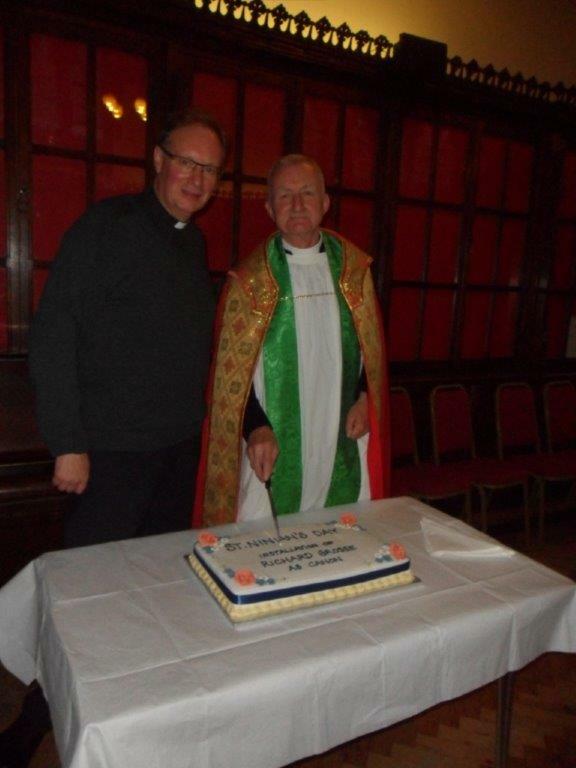 The service was very well attended with members of St Mary’s and St Andrew’s (Callander) attending. The singing was wonderful and all at the cathedral were very welcoming. 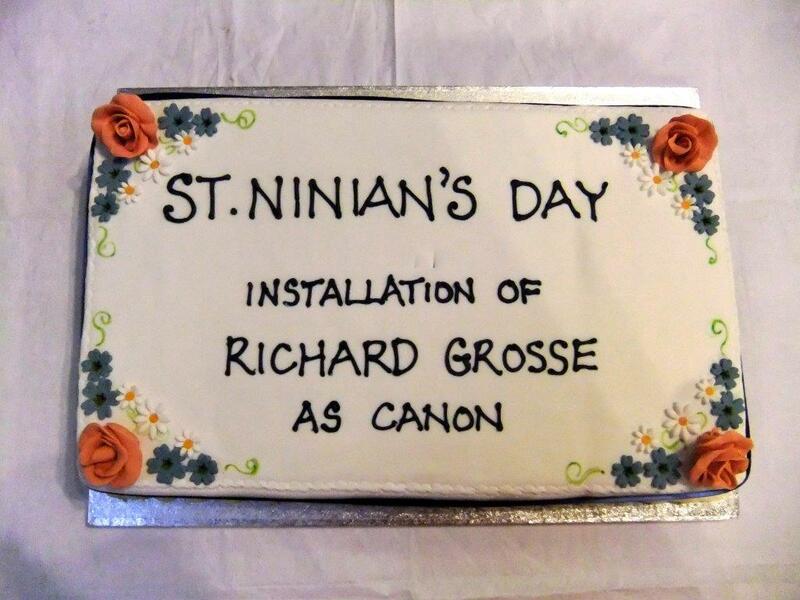 This entry was posted in News and tagged Canon, Installation, Perth Cathedral, Richard Grosse on September 24, 2015 by Stmary. Callander Vestry meets. The agenda should now be in the hands of Vestry Members. As the refugee crisis continues to escalate, many in our congregations are growing increasingly concerned, and are wondering what we might do. In response to this, many of the Cathedrals of the SEC are holding events at the end of September to mark their solidarity with those who are suffering at this time as a result of this crisis. For our part, St. Ninian’s Cathedral will be hosting a Day of Prayer and Action from 9am to 9pm on Thursday 24 September. The day will begin with a service of Holy Communion at 9am, in which all in the diocese are invited to take part. O Gauge Railway Display and ‘Railfuture Scotland’ which was recently involved in the reinstatement of the Borders Railway will be present: who knows, Callander might yet be served by rail again! More photos and displays with book and DVD stalls. Hamilton Toy Museum ‘ A hundred years of railway and other toys’ including the Museum’s garden railway weather permitting. Harvest supper and Quiz will be held at 19.30 at St Andrew’s Hall. If you are able to attend, please contact Evelyn Nicolson 01877 330436 or Fiona Gibson 01877 331508 email fionagibson20@btinternet.com to notify your intention to come and what you might be able to contribute. The information required by Evelyn and Fiona is set out below. Alternatively, there are paper forms in both churches. Could you please be in touch by Friday 25th September to assist with planning? It is suggested that each person brings one item serving six people. Join hundreds of thousands of people in capital cities around the world including Edinburgh marching for climate action as the UN climate talks in Paris begin. This entry was posted in Pew leaflet on September 20, 2015 by Stmary. Guidance notes from the Cal Aid website. Please read the lists of accepted donations below carefully before posting questions or making a drop-off, and please ensure donations are clean and in usable condition. The list will be updated regularly as circumstances change, and if there is an item we are not collecting there is good reason for it. No prior appointment is required for smaller loads, but for anybody coming with larger loads, please get in touch in advance so that we can ensure that we can accommodate you. Please don’t turn up out with the opening hours. We ask that nobody contact us directly at the moment unless urgent while we catch up on admin and launch our new website and email address. For those who have written or called, we aim to reply to everyone as quickly as we can. Please read on for further information about the project and thank you all for your continued support! We are a not-for-profit international humanitarian aid project working to help bring vital supplies and support to the displaced refugees across Europe, and also to challenge the largely negative and often false information being spread through the mainstream media. We wish to educate, to raise awareness and to support equality for all, because every body has the right to a basic quality of life. – Large cardboard/plastic boxes, parcel tape, bin liners, labels and other items that can used for packaging donations. – Men’s practical clothing, including warm jackets, waterproofs, trousers, belts, socks and underwear. In particular smaller sizes are more commonly required for all, so size small – medium is most useful, and bear in mind that winter is fast approaching. Please also remember that the European camps are populated largely by men, so men’s clothing and shoe’s are in much higher demand. We are collecting some women’s and children’s practical, warm clothing too, but priority is men’s. – Men’s, women’s and children’s practical shoes (trainers and walking boots, not flip-flops, town shoes or dress shoes). Again, men’s shoes are in far greater demand. – Gloves, scarves and hats. – Backpacks and travel bags (suitcases are less appropriate but still useful). – Candles, matches, torches and batteries, wind-up torches, head torches or other equipment that can be used for light. – Basic toiletries such as hand sanitiser, soap, toothpaste, wash cloths, toothbrushes, tissues, razors and shaving foam. – Vitamins, medicine and basic first aid supplies like plasters, bandages, antiseptic creams and over-the-counter painkillers. – Dry, packaged and tinned food that is easily transportable and won’t quickly expire. Pulses and grains such as lentils and rice are much appreciated, and products that do not contain gelatine or pork are important. – Camping stoves, pots, pans and utensils. – Smart phones with sim cards, and European adaptors. – Books in varying languages, including dictionaries and educational books. Donations to Anne Winther please – contact her direct for any queries. Its not too late to help !! This entry was posted in News on September 19, 2015 by Stmary. Richard Grosse, our Rector, is to be inducted as a Canon of Perth Cathedral at the evensong service tomorrow, 20th September. The service starts at 4.30 pm and we are invited to tea afterwards. It would be really wonderful if as many of the congregation could come to the service to support Ricard and Melanie at this significant event. HYMNS: A&M 192, CG 16, CG 78, A&M 125. (P 1214); John 12: 20. Monday Club at Gartmore House. For more senior members of St. Mary’s parish. Arrive at 11.00 for tea and coffee, followed by entertainment and lunch costing £3.50 . Transport available. Saturday 12th September 10.00—16.00 and 11.00—16.00 Sunday 13th September. St. Andrews Open Doors weekend. Callander Chimes will perform in the church at 11.00 and at midday. Hopefully Callander Brass will be there in the afternoon. Refreshments will be served all day. Booklets for the weekend are now available in both churches. Dunblane Area Council meets at St. Saviour’s, Bridge of Allan. The speaker is the Revd. Thomas Brauer, Diocesan Missioner ‘ Our Mission in Christ: imaginative understanding and creative practice for mission’. At St. Andrew’s and St. George’s West, George St.
Further details and full programme to follow. fionagibson20@btinternet.com to notify your intention to come and what you might be able to contribute. Alternatively there are paper forms in both churches. My great-grandfather decided to undertake a round the World Trip starting in October 1887 and going from Burnley in Lancashire to New Zealand and coming home by Cape Horn. Obviously he survived the trip because I have a copy of his diary of that trip; unfortunately the bit from Cape Horn back to Burnley is missing. But on November 2nd the boat docked at Colombo . This is an excerpt from his diary and I quote as he wrote – spelling and all. “I got up early it being only 5-15 when I went on deck. It was not yet light but there seemed to be plenty of life and noise. About 6 o’clock we had a very heavy shower of rain . After it began to be light the money changers began to come on board and the market price seemed to be 14 Rupees for a shilling. A church parade was held aboard the ship every Sunday. (The diary continues until June 1888 when he is nearing Cape Horn but sadly, as I have said, the diary from here is missing) As far as possible the spelling and forms of words and mis-spellings as used by my great grandfather, come from his text. All hand-written! This entry was posted in Pew leaflet on September 8, 2015 by Stmary. – Men’s warm jackets and waterproofs size small-medium, underwear and socks. Men’s belts and trousers and jeans size 28-32. The ratio of men to women in the camps is 10:1 and there are currently few children. – Men’s gloves, scarves and hats. – Tents, tarpaulins, sleeping bags, camp beds, sleeping mats, blankets and towels. – Basic toiletries such as hand sanitiser, bars of soap, toothpaste, wash cloths, toothbrushes, tissues, razors and shaving foam. – Vitamins, medicine and basic first aid supplies like plasters, bandages, antiseptic creams, over-the-counter painkillers and generic antibiotics. – Books in varying languages, including French and English dictionaries and educational books. This entry was posted in News on September 8, 2015 by Stmary.